The third season of Star Wars Rebels has proven to be an astounding one that somehow surpassed the greatness of a second season that heavily featured Ahsoka Tano, Darth Vader and a climactic battle between the two. From the numerous Rogue One connections to the end of Maul, Rebels established its rightful place within the overall saga and continued to show on a weekly basis how crucial the show has become as an avenue for augmenting the established Star Wars canon. The last three episodes I’ll be covering in this post exemplify that importance. “Double Agent Droid,” while easily the weakest of the three episodes, still has a lot to like about it. For starters, it’s fun to see Wedge again–especially in a capacity beyond fighter combat. As a former Imperial pilot, Wedge is uniquely qualified for a mission that sees him team up with AP-5 and Chopper to infiltrate an Imperial base in pursuit of clearance codes that will facilitate the rebels’ impending attack on Lothal. AP-5 has little trouble securing the codes in question, but Chopper proves to be not only gratuitous for this mission but also a hindrance. Tasked by Thrawn, the Imperial Information Office has been looking for any sign of the burgeoning rebellion, and Chopper’s status as an outdated model makes him an easily identifiable droid. The Imperials take advantage of this fact and manage to override Chopper’s programming while the droid is attempting access the Imperial network. Believing that Chopper is key to discovering the location of the Rebel base, the chief Imperial controller converts the droid into an Imperial spy and sends him back to the Ghost. Trust is one of the central issues of “Double Agent Droid,” and this is best exemplified by the crew’s implicit faith in Chopper’s loyalty despite obvious character changes and AP-5’s protestations that something is wrong with his stubby counterpart. Ultimately though, individuality is a character trait inherent in the rebels that the Empire simply can’t replicate and Hera (the one who knows Chopper best) quickly ascertains the truth of things–which brings me to the best part of the episode. Having correctly determined that Chopper is under Imperial control and is linked remotely to one its starships, Hera reverses the feed, overloads the signal, and destroys the ship and its crew. Soon, Chopper returns to normal and the adventure ends with the Rebels scoring double victories by securing the Lothal clearance codes and keeping the location of their own base a secret. Another piece is in place for the final battle, but I can’t help but feeling that “Double Agent Droid” could’ve built the tension a bit more effectively if the Imperials had at least narrowed down the location of the Rebel base–if not outright discovering it. It would have lent the episode a bit more gravitas, but then again one must remember that we’re talking about a kid’s show on Disney XD. “Twin Suns,” on the other hand, has gravitas in droves. Featuring the long-awaited rematch of Obi-Wan Kenobi and Maul, this episode delivers on a level not often reached in animation. It’s fitting on a number of levels that Maul meets his end on Star Wars Rebels after Dave Filoni and company brought him back on The Clone Wars, and though some of their plans for the former Sith never made it to screen, enough of the story did to bring it to a satisfying conclusion. Thematically, “Twin Suns” feels less like an episode of Rebels than a standalone story akin to Rogue One. Most of the series’ major players are barely present, and even Ezra feels more like a plot device than a character as his primary function is to bring (albeit unwittingly) Kenobi and Maul together. However, some (like Sam Witwer who definitely knows a thing or two about Star Wars) would argue that Ezra’s ultimate purpose in “Twin Suns” is to take the viewer on an abbreviated journey that mirrors those of Kenobi and Maul. For instance, the skirmish with the Sand People that ends abruptly when Maul (a former Sith) intervenes is an analogue of the Clone Wars–a series of pitched battles that terminated precisely when Palpatine (a current Sith) wanted them to. Similarly, Ezra’s trek through the Tatooine desert and (temporary) loss of Chopper signifies the desperate, lonely paths of loss and isolation taken by both Ben Kenobi and (the erstwhile Darth) Maul. In any case, connections abound in “Twin Suns,“ be they metaphorical or literal. Earlier this season in both “The Holocrons of Fate” and “Visions and Voices,” it was firmly established that Maul and Ezra are linked through the Force due to their shared experience of uniting the Jedi and Sith holocrons. And just as Maul used that to his advantage in “Visions and Voices,” he again manipulates Ezra–this time into leading him directly to Kenobi. Just how tangible Maul’s presence in Ezra’s mind actually is depends greatly on your own point of view (to borrow a phrase) as it’s left intentionally vague. Wandering through a desert can cause one to hallucinate due to dehydration and other factors, but the fact remains that Maul definitely has a hold on Ezra and follows him to his quarry. Kenobi, on the other hand, seems virtually unfazed by Maul’s presence on Tatooine. Having long ago adapted to his role of silent and watchful guardian of Luke Skywalker, Ben Kenobi listens to Ezra’s warnings but only reluctantly decides he must fight his “old adversary” to protect his charge. Kenobi’s purpose is clear, but Maul’s is hazy at best as the former Sith has only anger and his pursuit of revenge, so with Ezra sent away to return to this friends, the two grizzled warriors engage in a contest of wills, philosophies, and fighting styles. The fight itself is very brief, but that is because it is decided during its prologue. As Maul seethes with rage in anticipation and taunts Kenobi with implicit threats to Luke, Obi-Wan shifts strategies from that of his younger self, to that of Qui-Gon, to that of the “Old Ben” we know from A New Hope. He is firmly in control of his emotions, his body, and therefore the fight. So when Maul lunges at him and attempts the same maneuver that killed Qui-Gon Jinn on Naboo all those years ago, Kenobi identifies it quickly and deftly swings his blade northward to bisect Maul’s saber and deliver a fatal strike to the Zabrak’s chest. What follows is a moment rife with conflicting emotions as we see the two combatants share a moment of mutual respect. Kenobi has no hate for Maul, but rather pities him. And Maul seems to find peace at his end through Kenobi’s assertion that he has been protecting the “Chosen One,” a person Maul feels will avenge him and others (including Kenobi) whose lives the Emperor has ruined. There has been–and will continue to be–much debate over Kenobi’s claim that Luke is the “Chosen One” rather than Anakin, and I invite you to join the debate in the comments section of this post. There are arguments to be made on both sides, but I think we can all agree that seeing Luke Skywalker–even from a distance–was one of the cooler moments in the history of Star Wars Rebels. “Zero Hour” wraps up Rebels’ third season and mostly delivers on the promise of seeing a full-scale conflict between Thrawn and the Rebel fleet. Several slow-burning plot elements come to fruition beginning with Kallus’ reveal as a double-agent to the Empire. It’s clear that Thrawn knew Kallus’ true nature for some time and was simply waiting for the right moment to spring the trap, and he does so in “Zero Hour” when he confronts Kallus in the middle of the latter’s attempt to warn the rebels that Thrawn knows about their attack on Lothal. Enough of the signal goes through to the Attolon base to give Hera and company time to prepare, but the trajectory of the signal becomes a key piece for Thrawn to ascertain their location. And so the Rebels must shift from offense to defense and evacuate their base as quickly as possible. There are several nods to the Echo Base sequence from The Empire Strikes Back including the use of shield generator to repel an orbital bombardment and a ground assault featuring AT-ATs, but the connections to both Rogue One and A New Hope are prevalent as well exemplified by the presence of General Dodonna and Death Troopers who serve under Thrawn in this episode. In short, Thrawn’s plan is to capture the Rebel leadership through the use of a blockade, and interdictor cruisers (first introduced in “Stealth Strike”) are employed to keep them from escaping. Hera’s plan in response to this tactic is to send Kanan and Ezra through the blockade by any means necessary in order to bring back help. Ultimately, the two Jedi accept this mission in different ways with Ezra going to Krownest in search of Sabine’s help while Kanan searches out the Bendu. But in order for Ezra to escape the blockade, a sacrifice must be made and Commander Sato willingly makes it as he rams the Phoenix Home into Admiral Konstantine’s interdictor cruiser in a spectacular sequence that echoes the Hammerhead corvette tactic in Rogue One. It’s a blow for both sides of the conflict and effectively brings Phoenix Squadron to an end. Fortunately, it does allow Ezra to make his way to Sabine’s homeworld and bring her back with reinforcements to attack the Empire’s other interdictor cruiser in orbit above Attolon. Kanan has similar success, but with a vastly different approach. Whereas Ezra appeals to the Mandalorian’s sense of justice and honor, Kanan ultimately must resort to insulting the ambivalent Bendu. Claiming he is above such petty conflicts, the Bendu is unaffected by Kanan’s appeals to his morality and is only motivated to act when Kanan accuses him of cowardice. And when he acts, it’s elemental, violent, and without prejudice. The Bendu simply wants to be left alone and this literal force of nature begins to destroy all who threaten that. The final moments of the three-way battle between the Bendu, the Empire and the Rebellion–both in space and on the ground–are visually stunning, but ultimately without much price. All of the major characters survive (including Thrawn) which hopefully sets up an even bigger conflict in season 4. Star Wars Rebels is hurtling along toward the events of Rogue One, and while that film has removed some of the drama by revealing that Chopper, Hera, and the Ghost survive, it also serves as a logical endpoint for Rebels. I can only assume that next season will finally disclose the fates of Kanan and Ezra as the two Jedi seemingly can’t exist (at least in their present forms) by the events of the original trilogy. The same goes for Grand Admiral Thrawn who was finally shown to be fallible in “Zero Hour” through his miscalculations–including his assumption that Attolon was the home of the entire Rebel fleet. We should know more in a couple of weeks as a season 4 trailer is sure to drop during Star Wars Celebration, but the wait until next fall will be a long one. And don’t forget to check out Rebels Reactions for even more insight, discussion, and analysis of these episodes. 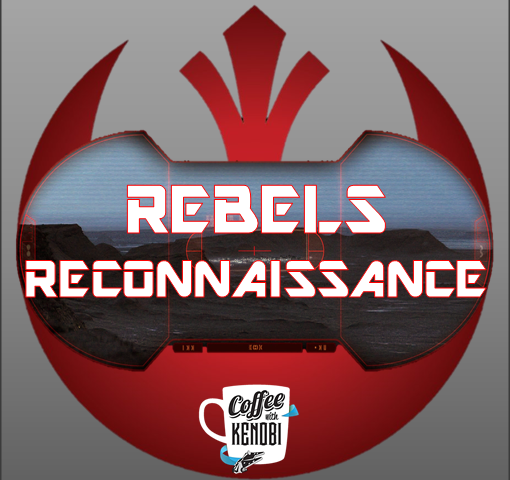 Rogue 3 at "Star Wars in the Classroom" and STAR WARS REBELS reviewer for Coffee With Kenobi.